With marathon training in Chicago comes hot weather, and the need to hydrate before runs drastically increases. If you’re like me, drinking water doesn’t come easy; I try and drink it with every meal, and obviously during and after my workouts, but I definitely struggle to force the tasteless fluid down my throat. Even if I wasn’t a runner or active person, I know I am not drinking as much water as I should be. According to Web MD, a person should drink between half an ounce and an ounce of water for each pound you weigh, every day. Divide that by 8 ounces (the standard size glass), and that’s how many glasses you should drink a day. It’s safe to say I’m nowhere close to my daily requirement, and I am pretty active. This seems to be a common problem among athletes, common enough that Hidrate Spark created a product to help you reach your goal of water intake every day. 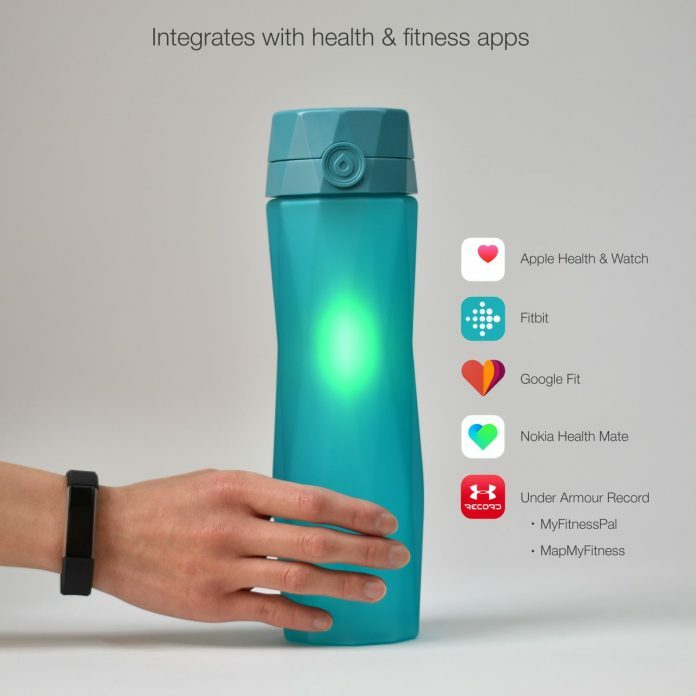 The Hidrate Spark 2.0 water bottle looks like your standard water bottle, and can be just that, but hooked up to its Hidrate app, it is arguably one of the most useful products for those lacking on their water drinking. Inside the twist-off cap is a long white stick that reaches to the bottom of the bottle, and inside that is a battery. This battery then hooks up to the Hidrate app via Bluetooth, and tracks the amount of water being drunken at all times. If a user is behind on their daily requirement, the stick then blinks a bright color to remind you to drink more. But wait, it gets better. The app itself is a tracker that allows the user to follow along on their drinking achievements, and set goals for themselves. When first downloaded, Hidrate asks the user to enter in demographical information, including weight and activity level, and it then spits out a number of fluid ounces to be drunken each day. 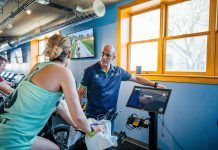 Users can also sync it to their Fitbit, Apple Watch, Apple Health, Google Fit, Under Armour Record, and Nokia Health Mate to reevaluate hydration needs for their specific activity levels. The app also allows users to add water drunken from a different source to allow for more accuracy, and even has a “compete with friends” feature to push the motivation further. As mentioned above, I need all the help I can get when it comes to proper hydration. During the week when I’m at work, my water bottle sits away from viewing on my desk, and I forget about it. With the Hidrate Spark, though, I get updates on my phone from the app to drink, along with the flashing reminders. I still have yet to try and sync it to my Apple Watch, but I know that if I got reminders on that like I do on my phone, it will only make me drink more. After using this water bottle for a couple of months, I honestly find myself being more conscious about my water consumption. I check the app several times a day to make sure I am on pace to hit my goal, and make sure I drink every time the bottle flashes. I even have the high school girls track team that I coach letting me know when my bottle is flashing, and a few of the girls have even bought the water bottle after seeing mine. The biggest perk in my mind, though, is that it never needs to be recharged. The battery provided lasts forever, and if it does die, a replacement is included in the package. Oh, and the bottle flashes once you hit your goal too, so that’s exciting. No, I’m not hitting my goals every day, and I think I could definitely drink even more than the number given to me (the app gives you the minimum fluid ounces of water you need), but I have definitely prioritized hydration more since I’ve gotten it. I mean, if a flashing water bottle can’t get me to drink water, what will? The Hidrate Spark comes in six different colors and is $54.95. It is available at Target or on https://hidratespark.com. After using this water bottle for a couple of months, I honestly find myself being more conscious about my water consumption. I check the app several times a day to make sure I am on pace to hit my goal, and make sure I drink every time the bottle flashes. No, I’m not hitting my goals every day, and I think I could definitely drink even more than the number given to me (the app gives you the minimum fluid ounces of water you need), but I have definitely prioritized hydration more since I’ve gotten it.